The GAYLORD family in the Pitminster region of Somerset England is known in early Connecticut by Alice GAYLORD who had married Richard TREAT 27 Apr 1615. Richard and Alice came to America in 1630 with their 9 surviving children. [Treat Genealogy]. Note that TREAT is TROTT in England. Alice is the first Gaylord I ran across in my research. Alice and her husband, Richard TREAT, were the parents of (Gov.) Robert TREAT, Robert being the 6th of 11 known children of this early settler couple. Some information on Alice was found through searching the TREAT biographies and records. 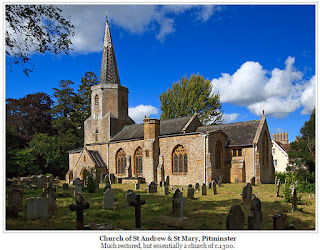 I found Alice's surname unusual and went searching for any possible ancestors in Pitminster. There are many variants of the name as shown in the title of this blog. It is believed the original surname is of French Huguenot origin: GAILLARD of Normandy. There are also early Gaillard settlers in the southeast states who came directly from Normandy. For those who love history: The Bayeux Tapestry may be 'read' for the history of the conquest of England by William, the Conqueror, uniting England and Normandy. Alice seems to have been the youngest of 5 children of Hugh GAYLORD and wife Johane AILVYN, and was baptised 10 May 1594 at the church of St. Andrew & St. Mary, built about 1300. Hugh assisted his mother in executing his father Nicholas' will in 1546, and later was executor of his mother Johane's will in 1572. Thank heavens for wills - they provide confirmation or strong evidence of lines of descent, siblings, occupations, land holdings, and more. Hugh's will unfortunately perished [via bombs, WW2], but is recorded in the Taunton Calendars (File 1614, No. 110). He had a number of lands in the region around Pitminster: Poundisford, Smalecross, Trull, Lakemead, Southgrove, and Smalrest. Hugh's parents were Nicholas GAYLORD and Johane [surname possibly SEVENOAK - not proven]. 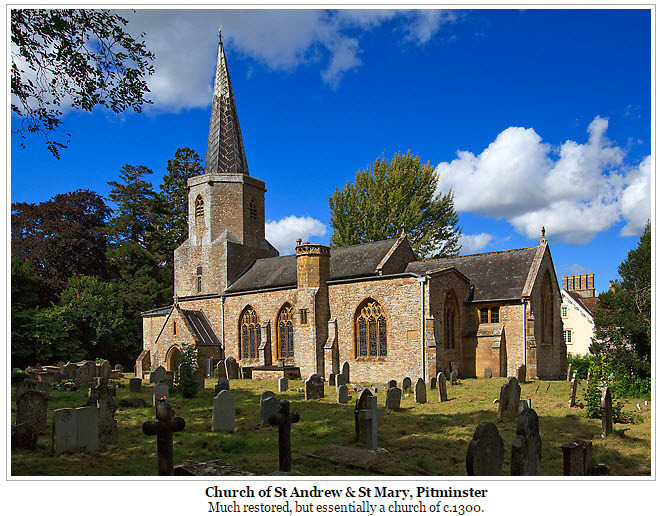 Nicholas died 25 Mar 1546 and was buried 7 Apr 1546 at Pitminster, at age 31. A very young man. I do not have the reason for his death. His wife Johane would have been left with 3 known children, and she married Giles Alvyn, and had at least two more children. She died about 29 Aug 1572, aged 49 years. Nicholas GAYLORD's will is dated 25 March 1546; he is noted to have been buried on 7 Apr 1546. As you can see there were two Joan/Johane ALVYN/AILVYN women who married GAYLORD men. I have seen online trees with the children thoroughly mixed up because of this issue. Giles and Joan Alvyn were possibly cousins of the GAYLORD family. A little hard to research and prove after so many centuries! If you know anything more about any of the above individuals, I would be so pleased for more details. And if you wish more information on them, I'm also happy to share. Contact me at my address at the bottom of the page or, in the Comments section. My Blogger account seems not to allow me to "reply" to your comments. However, I will post replies to your comments, so check back later. Do know that I value your comments immensely. You make my day! Thanks for stopping by to read my personal genealogy posts. Here's a very early settler to New England - but, she didn't quite make it. She was one of a number of passengers on the "Jonathan" to Boston Harbour who lost their lives on the challenging voyage. Agnes GOSLING. She was born approximately 1570 in Weyhill area, Hampshire, England. There are a number of Gosling families in Hampshire, but no parents have yet been proven for this very early period. Although her marriage date is noted from those who seem to have seen the original record or an index, I have not yet seen an original where I would expect to find her father's name. 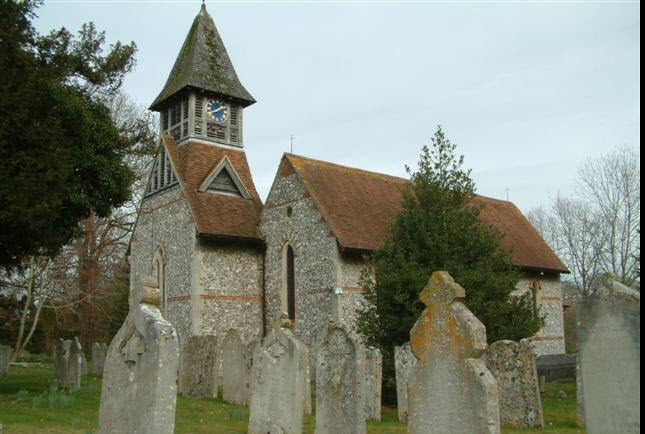 The church below, St Michael's & All Angels, may be the one her family attended. Maria, bap 24 Sep 1598, buried 2 Feb 1598/99. Agnes' husband, Robert BENT, was a successful farmer, a yeoman, who was buried July 29th, 1631, leaving her a widow. The overseer of Robert's will, Peter Noyes, encouraged moving to America, having travelled on the same ship as Agnes' son John in 1638, along with several other families. Her son, John and his wife Martha left for New England on the ship "Confidence" which sailed out from Southampton on April 30th, 1638. The following year, the widow Agnes GOSLING Bent, with her daughter Jane's only two surviving children (the Plympton grandchildren, Thomas & Elizabeth), her daughter Agnes Blanchard, husband Thomas and family, all set sail on the ship, "Jonathan" from Southampton. And as the ship arrived in Boston Harbor in June of 1639, Agnes died, never having set foot in New England. Her son-in-law, Thomas apparently had her carried ashore and buried. Her burial place is not known. A new beginning which started out with great hopes, with a very sad ending. If you have more information or questions about this ancestor, I would love to hear from you through contact information below. Blogger is not allowing me to reply directly to any commenters, unfortunately. However I am always thrilled when someone leaves a comment! Thank you for stopping by and reading about the ancestors of my children.